Documentarian Alex Gibney (ENRON: THE SMARTEST GUYS IN THE ROOM, TAXI TO THE DARK SIDE) has a convincing but controversial thesis. That the enemies Eliot Spitzer made on Wall Street as New York Attorney-General, and in Albany as New York State Governor, combined to bring him down - exploiting his use of prostitutes with a FBI inquiry that was maliciously leaked to the press. Spitzer himself comes across as less melodramatic. He takes ownership of his mistakes, though unwilling to be drawn on the psychology behind them. He is also less than candid about how pugnacious he truly was as Attorney-General and State Governor. He comes across as an idealistic man who resorted to a thug-fight, and naively seems surprised that the people he bruised would resort to the same vicious tactics to exploit his mistakes. Spitzer is not a man one necessarily warms to, but was essentially right to throw a searchlight on Wall Street. And it says something that he was willing to give Alex Gibney an interview. The people who come off far worse than Spitzer are those Spitzer opposed - notably Frank Langone and Hank Greenberg - titans of Wall Street who resented Spitzer's legal cases against their fraudulent behaviour - fraud that has since been exposed in the 2008 financial crash. They come across as venal, smug, and crowing over his defeat. By comparison, Spitzer's political opponent, New York Senator Joe Bruno, since convicted of fraud, comes across as a mere second-tier fraudster. The prostitute, "Kristen" or Ashley Dupree, also comes off as a slick media-manipulator, eager to cash in on her new-found fame, enabled by the right wing media who love nothing more than to keep her in the public profile and thus keep Spitzer's name tarnished. The biggest surprise of the documentary was the prostitute that Spitzer sought out most frequently and who appears in the doc played by an actress to protect her identity. She comes across as smart, empowered, with enough integrity to spurn the media and just get on with her life. I guess it says something about the modern-day corruption of the politico-economic establishment when a whore is the most sane, selfless and intelligent voice in the room. The resulting documentary is an even-handed tale of hubris and nemesis. Spitzer made his own mistakes, but the people he pissed off took full advantage. Does it need to be two hours long? It certainly lost pace in the second hour. Does it need to be seen on the big screen? No. Gibney produces very high quality work, but this could easily be seen on the small screen. But for all that, this is a film that tells its story meticulously, has the air of truth about it, and educated me about the intricacies of Spitzer's downfall. Although I had followed his case closely at the time, it was fascinating to see a well researched documentary take us through the planted media stories and behind the scenes. 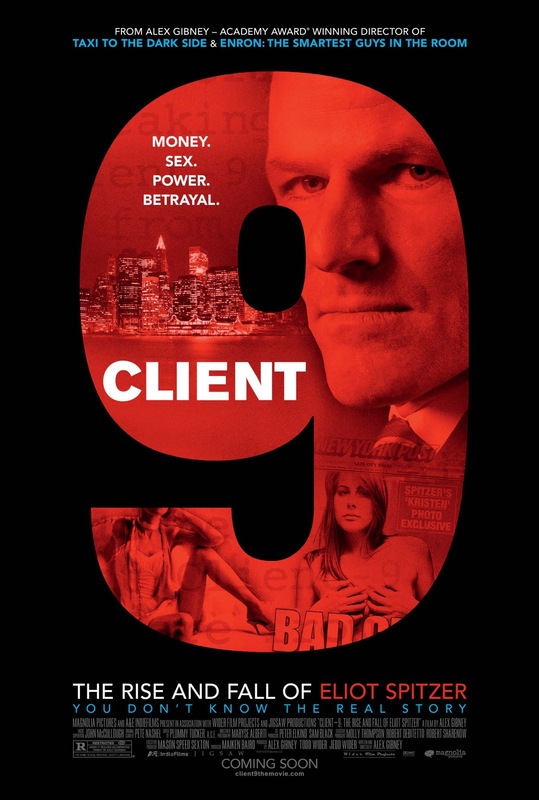 CLIENT 9: THE RISE AND FALL OF ELIOT SPITZER played Toronto 2010 and went on release in the US and Canada last November. It is currently on release in the UK and has been released on Region 1 DVD.